Gecko team will be present at the FIAT / IFTA World Conference 2018! Discover our vision for archiving at IASA 2018 in Ghana! Join us at AES Culpeper 2018! The history of sound was written on a multitude of analog and digital medias for more than a century. 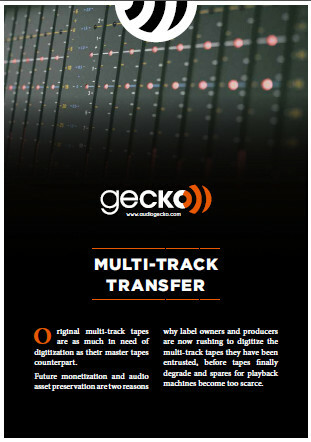 Gecko supports the inheritors of these medias from the past and offers a wide range of services to preserve this legacy and to give it a new life in modern digital format. The passion of sound is what drives us. It has always been the motor of our experience on which relies our know-how. Today, it allows us to make the sound travel throughout the ages with the deep respect it takes to preserve its quality and authenticity. We are sound specialists. Analog and digital. Two worlds, two eras, two different technologies. To make the link with success we must understand their DNA. At Gecko, two generations of specialists gather around that same goal. We are a bridge between two edges. 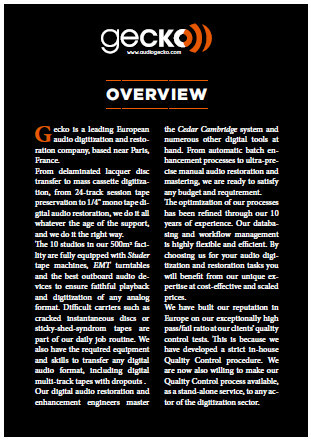 Sound is a noble material, thus we drive every project with the expertise of a craftsman. 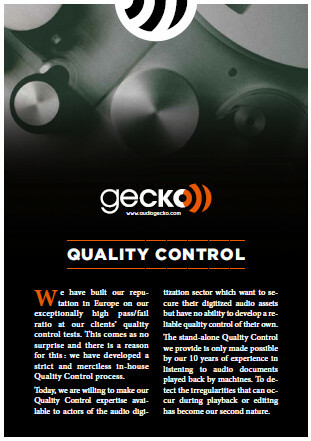 At Gecko, we are able to maintain that same level of production quality, be it for 100 or 50,000 medias: we are craftsmen and industrialists at the same time. coffee capsules per day (espresso, ristretto, americano, decafeinato, macchiato, etc. ), to make sure our ears are always on the alert. In our field, listening is the most important part of the job. It is the cornerstone of our advising approach : listening to your goals, responsibilities and structural constraints is the key to success for your short and long-term projects. Our production tools are at the heart of our performance. They allow us to deal with any demand at any time. 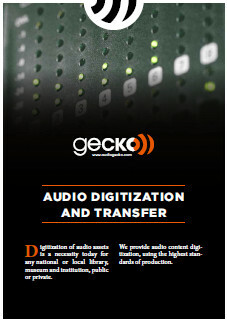 At Gecko, we have state-of-the-art equipment, mature processes and permanent control of risk. They enable a fast and efficient delivery of our expertise and production. Tools are nothing without brains. At Gecko, our full-time employees are all specialists in their fields (computer science, audio, project management, logistics...). It is the guarantee of the full-control and in-house transmission of our savoir-faire. To convert audio from any format into a digital file fitting to your specific exploitation needs. To valorise the audio legacy using the highest level of skills for any project thanks to flexible and powerful production tools. Single entry point, dedicated team and studios. Tailored to the specific requirements of the project. Quality management plan, when required. Ability to send our engineers and equipment for on-site operation, anywhere in the world. Local process of the medias, at the Gecko site in Montreuil, in the Paris area, using our own carriage means and logistics. Individual process, including complete listening, of each media. Simultaneous process of several medias, using parallel chains. Physical refurbishment and preparation of the medias before digitization. Analysis, description and archival storage of the audio contents. 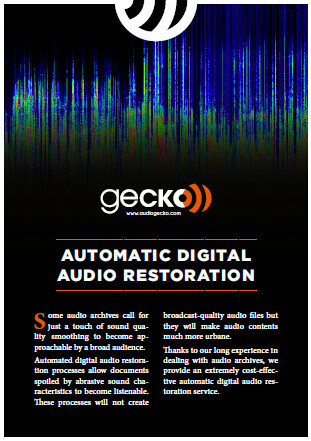 Automatic sound restoration with settings based on the average sound quality of the whole lot. 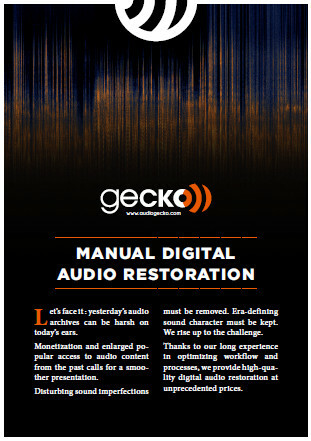 To restore the original acoustic properties of a sound item, taking into account the desired end medium. Full-control of the quality requirements of any broadcasting format (HD, web...). Suppression of any imperfections due to the deterioration of a physical media (or any original problems). Remastering to fit today's speakers and listening habits according to your expectations : we will make your archives sound better than they ever did. © 2015-2018 Gecko. All Rights Reserved.